Beloved mother of Terry (dec), Mark (dec), Brett (dec), Chris, Baz, Sue and Toni (dec). Loving grandmother and great grandmother to her family. Ms Taylor's funeral service will be held in the chapel of Western Districts Memorial Park Crematorium, Boothenba Road, Dubbo on Friday 12th April 2019 commencing at 11am. Loving parents of Lesley & Bill, Nettie & Graham, Chris & Bernard, James & Chris and Lindsay & Selina. Cherished grandparents of their 9 grandchildren and great-grandparents of their 7 great-grandchildren. A combined funeral service for Les & Jean will be held in St Andrew's Chapel, Wingewarra Street, Dubbo on Saturday 16th March, 2019 commencing at 10am followed by interment in the Western Districts Memorial Park Lawn Cemetery, Boothenba Road, Dubbo. Loving wife of Tommy Toomey (dec). Loving mother of Joan, June, Terry, Elizabeth (dec), Janet, Thomas, Tracey and Tresa (dec). Loving grandmother to Terri-Boy (dec), Jonathon, Spocky, Seth, Anthony and Terry. Adored grandmother and great-grandmother to her family. Much loved father of Karen and David, their partners David and Brooke, and their families. Adored grandfather of Sara, Natalie and Brianna. Mr Shuttle's funeral service will be held in the chapel of Western Districts Memorial Park Crematorium, Boothenba Road, Dubbo on Wednesday 13th February 2019 commencing at 11am. Adored mother and mother-in-law of Micheal & Bethany, Brian & Helane and Tracey & Mitchell. Much loved Grandma of Emmerson, Chloe, Mia, Jayden and Ruby. Karen's funeral service will be held in the chapel of Western Districts Memorial Park Crematorium, Boothenba Road, Dubbo on Monday 4th February 2019 commencing at 1pm. Sadly missed by her loyal companion, BB. 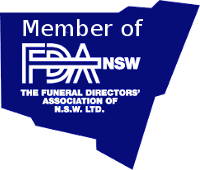 Miss Pincham’s funeral service will be held at St Andrew’s Chapel, 72 Wingewarra Street, Dubbo on Friday 18th January 2019 commencing at 9.30am followed by a private cremation. Loved son of Mr Keith Hayden. Loving father of Brandon, Alexander, Cassandra and Miranda. Loved grandfather of Zac and Adelyn.